This postcard contains the year 1910 within its design. That tells us it was probably published to show the architect’s drawings for the new Central Presbyterian Church that would be built on two vacant lots at 14th Street and 10th Avenue. The upper left corner of the postcard commemorates an older church which was destroyed in 1910. Behind the church there’s a glimpse of a house that preceded the church and which would eventually become the parsonage. We also found it interesting that the drawing shows a horse and carriage, while newspapers of the era concentrated on ads for autos. A year earlier, in 1909, the Central congregation had moved to a temporary location at 12th Street and 11th Avenue. The move from the old church, which faced the courthouse across Second Avenue, was fortuitous because around 3 am on April 2, 1910, the east wall of the empty church collapsed, apparently due to a defective brick foundation. That foundation consisted of two thin parallel brick walls, with no structural tie between them. Over the years the walls separated, and the upper wall simply fell into the space between. The old church was built in 1855 or 1857 (reports vary) and lost its original steeple, reported to be the highest in the vicinity, in a tornado about 1874. The steeple was not rebuilt, and the central tower was modified to look like that on the postcard. After the wall collapsed, the building was razed, but its bell, pews, pulpit, chairs and pipe organ were salvaged. 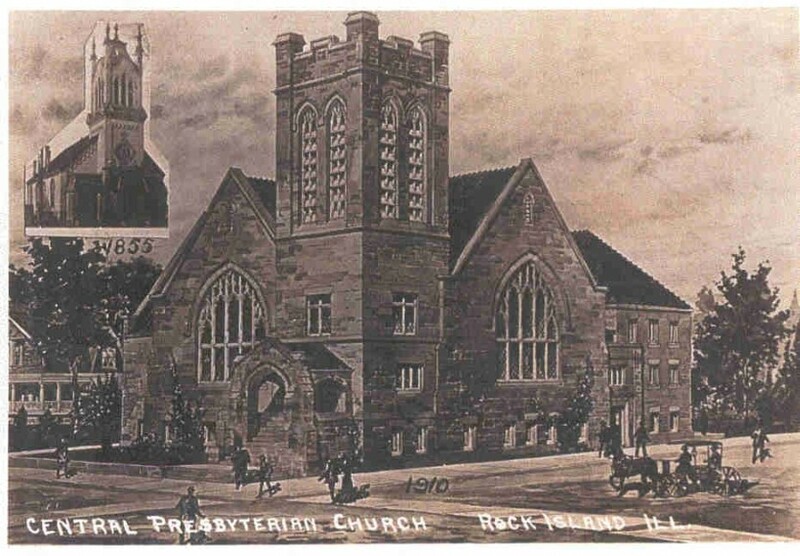 The name Central Presbyterian was adopted in 1875 by a congregation which had previously been known simply as the Presbyterian Church of Rock Island. That congregation itself was itself a merger of the former Second and First Presbyterian churches, which had divided on slavery issues in 1837 when it was but a few years old. The featured church was designed by Sidney Rose Badgley of the Cleveland architectural firm Badgley & Nicholas, who was well known for his church designs. Amazingly, this magnificent English Tudor style church was completed in less than one year, at a cost estimated at $40,000. Groundbreaking was reported to be March 12, 1911, although the cornerstone said to be laid in August, 1910. The formal dedication was held on March 3, 1912. According to former Augustana College Art History Professor Dr. Mary Em Kirn, the English Tudor style is a form of Gothic architecture that developed in England and was popular during the 14th to the 16th Century. And although the style is uncommon in Rock Island, Central is an outstanding example. The walls of the 76 x 90 church were made of sawed Bedford (Indiana) limestone, while the trimmings and window frames were of tooled Bedford stone. The sawed stone provides a subtle horizontal texture to the walls, while the tooled stone is very smooth. The roof was originally Bangor (Maine) slate with a cornice of copper. The stained glass windows — even the basement windows are stained glass — were made by Von Gerichter Art Glass of Cleveland, Ohio. On the exterior, ribbons of greenish-blue opalescent glass echo the patina of the copper gutters and downspouts. But the true magnificence of the windows is reserved for the interior, where the dramatic auditorium (sanctuary) has three walls made largely of glass. Flemish oak is used for pews and paneling and the plastered walls were oil tinted in “soft green and tan.”. The ceiling originally was paneled and the roof trusses were encased in ornamental oak. Although the ornate trusses are still there, in original condition, the paneling has been painted or covered, probably to make the ceiling brighter. The pews are curved and the floor is gently sloped. The architect’s innovative design allowed the auditorium to be expanded for large crowds. An adjacent large open “chair room” and Sunday School was accessible by simply lifting a partition, reportedly increasing the seating from 375 to 950. The partition, said to weigh “several tons,” was easy to move with a “mechanical device.” The pulpit was carefully located to be visible from the Sunday School room as well as the auditorium. This still operable partition remains. The main entrance is in the corner tower and leads to a roomy vestibule. Above the vestibule is the pastor’s study and above that is the bell tower, designed to hold the 1850s bell salvaged from the old church, which was installed here in time for the 1912 dedication. In 1992, Central merged with First United, to form Good Shepherd Presbyterian, which meets at 24th Street and 18th Avenue, the former First United church. The old Central Church was rented for a time until being purchased several years ago by Greater Antioch Baptist Church, which moved from another church building at 24th Street and 8th Avenue. This article, by Diane Oestreich, is slightly modified from the original, which appeared in the Rock Island Argus and Moline Dispatch on August 17, 2003.